The conference was organised March 11-12th by the National Priority Area of Cancer Research, a perennial initiative led by the Norwegian Radium Hospital, Oslo University Hospital. The chair for the conference was professor Ragnhild A. Lothe from the Department of Molecular Oncology, the Norwegian Radium Hospital, OUH, together with professor Per Eystein Lønning at Haukeland University Hospital. The conference was organized for the second consecutive year and aims to make the path shorter from research to clinic. Young oncologists were especially invited to the conference this year. Present at the conference was also Head of the research Department, Jannikke Ludt, from The Norwegian Cancer Society. Ludt found the conference "A very good arrangement which shows a pressure on implementation, and simultaneously highlights the challenges with models pre- and implementation of -clinical studies in personalized medicine. I got important "take-home messages", both through the presentations and through discussions with our partners. Very rewarding! " For oncologist Odd Terje Brustugun at the Norwegian Radium Hospital, OUS, who held a lecture on possibilities within lung cancer genomics, the conference proved to be “A very useful meeting point between clinicians and translational researchers. It pointed out both challenges and opportunities within the cancer genomics field. Perhaps the most important lesson to bring home was that as yet it is relatively limited what molecular mapping of tumors has given the survival effect for cancer patients. A targeted approach, based on possible clinical relevance should perhaps to a greater extent prevail for project design in the field. " The next Losby conference will be held in March 2016. Master of ceremonies Sissel Rogne (center), director the The Norwegian Biotechnology Advisory Board, chaired the "Skavlan panel" during the conference. There were participants from both the pharmaceutic industry as well as the Norwegian regional health authorities. 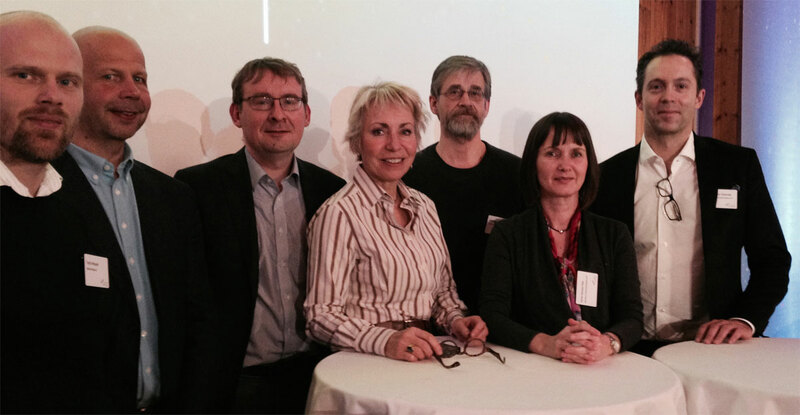 From left: Dr. Terje Cruickshank Ahlquist (Roche Norge), Jens Bjørheim (AstraZeneca), Dr. Ian Mills (NCMM), Sissel Rogne, professor Eivind Hovig (Institute for Cancer Research, OUH), professor Anne Hansen Ree (Akershus University Hospital) and dr. Hans Petter Eikesdal (Haukeland University Hospital).